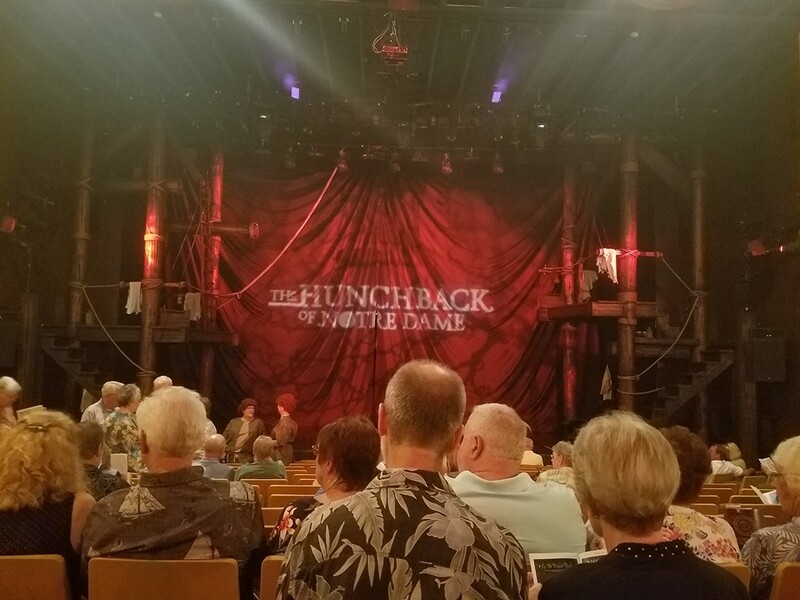 If you follow TheHunchblog on Facebook then you might know that last week on July 28th I went to see Ogunquit Playhouse’s production of The Hunchback of Notre Dame. I do feel very lucky that I got to see it although I do live relatively close to Ogunquit Maine. 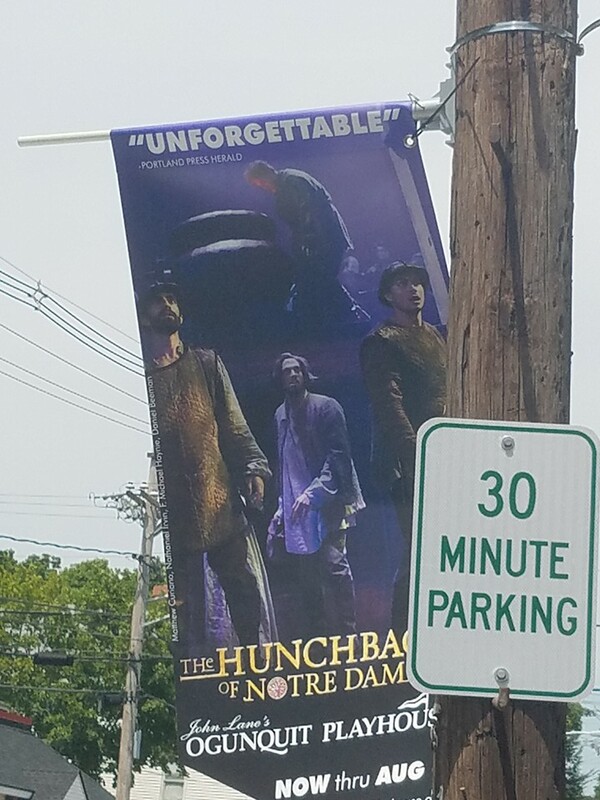 First off, in center area of Ogunquit, which is a nice beach town, promotions for the play were everywhere, which is common. Above is the one I took a picture of as it was the closest to the car near where I ate lunch but there were tons, I wish I could have taken more picture. Also I went to a matinee show so there were a lot of older people but there were children sitting behind me. The show was nearly sold out but there were a empty sits most noticeably next to me. Also they had two signature cocktails, The Quasimodo and the Esmeralda. I tried both and as I’m a super light-weight when it comes to drinking I felt those drinks later, no worries though I wasn’t the driver. Alway I did end preferring the Quasimodo to the Esmeralda. Oddly the Quasimodo was green and I don’t really recall what was in aside from pineapple juice and the Esmeralda was blue with a peach vodka and lemonade, it had a spicier taste. Also they give you the glasses a souvenir so that is cool. One more thing. as I was leaving I did see a few of the actors mostly the extra but I did see the guy who played Clopin, Paolo Montalban, leaving and walking off down the street. I didn’t say anything because I’m criminally shy and I don’t really like to bother people. So the show itself? So what did I think? Al lot of the nitpicks I had about the show were the same ones I had to Papermills/La Jolla version as this version isn’t much different. That being said, I am a touch more forgiving as musical plays are meant to be seen live and not in a tiny frame size on a computer. So while I can’t compare the versions in terms of plot and decision related to the plot I can discuss the performer and the production designs. I will say this, the costumes in the Papermills/La Jolla were a bit better. Esmeraldas’ costume in those version read more like her Disney costumes. That is not to say the Ogunquit costume were bad, they were fine. Esmeralda wore mainly pink, her corset was pink and her skirt looked green but in picture is read more as blue. Her dance costume was more Indian in style. It was pink choli top with a green skirt with a high slit and she wore legging. You can click here for press pictures. Also I didn’t love the fact that Frollo was in white the whole time but that is a nitpick. Though black is Frollo’s color in the book and most version follow suit. I did like Clopin’s costume more in this version though especially his Feast of Fools robe. Also it bear mentioning that Quasimodo in this version doesn’t not put any make-up on his face to convey the deformity and instead the actor did the work. Not sure how I feel about this since I have been hard in the Papermill and the La Jolla versions on this aspect. But I will say in the moment I didn’t mind it plus the stage sits kinda of level with the sits so I probably couldn’t have seen it otherwise. It’s a mixed feeling though. I did like the stage set up more in the version. While the stage is small it really didn’t feel as cluttered as the Papermills/La Jolla versions. I think it’s because they used the sides more and the choir was above most of the action. They also had a smaller congregation group and they seems to have set roles as part of the architecture. I’m not sure if that was the same in the Papermills/La Jolla versions but that might be a perk of seeing it live instead of in a tiny Aspect ratio. They also used a moving platform that was painted like the floor of Notre Dame but in less contrasting colors. While it wasn’t as accurate to the eddfice it was easier on the eyes. The simplifying of the sets made it better for the space and made it easier for the eye to rest. Not all the stagecraft was better, I did prefer Aphrodisius coming out as a stained glass window in Papermills/La Jolla version but again nitpick. Also the molten lead was handled better in those version as well but this version got rid of the confusion run through the Gallery of kings so it’s a trade-off. The acting and the performances were good across the board. I can’t complain there. I will say that while the Frollo seemed younger than is typical, he did get more angry in Hellfire than Patrick Page did. All in all, I’m very happy I got to see the show and if it’s playing in a theater near you do go see it. I agree with alot of what you thought of the costumes and makeup. Esmeralda’s dance costume did have an Indian-Middle Eastern vibe to it, but it was still beautiful but I love the fact that the costumes didn’t have a huge Renaissance faire vibe like the La Jolla/Paper Mill productions. 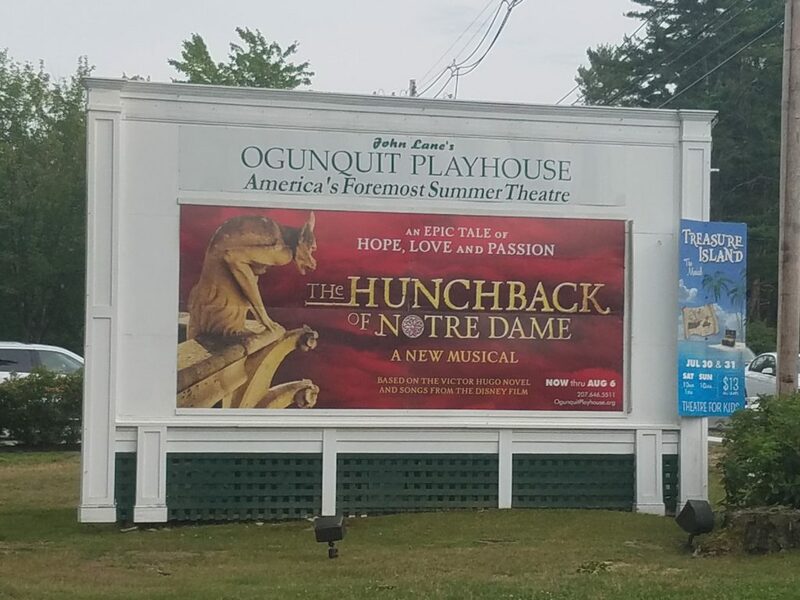 The ones at Ogunquit Playhouse had a small vibe to that but not by much. 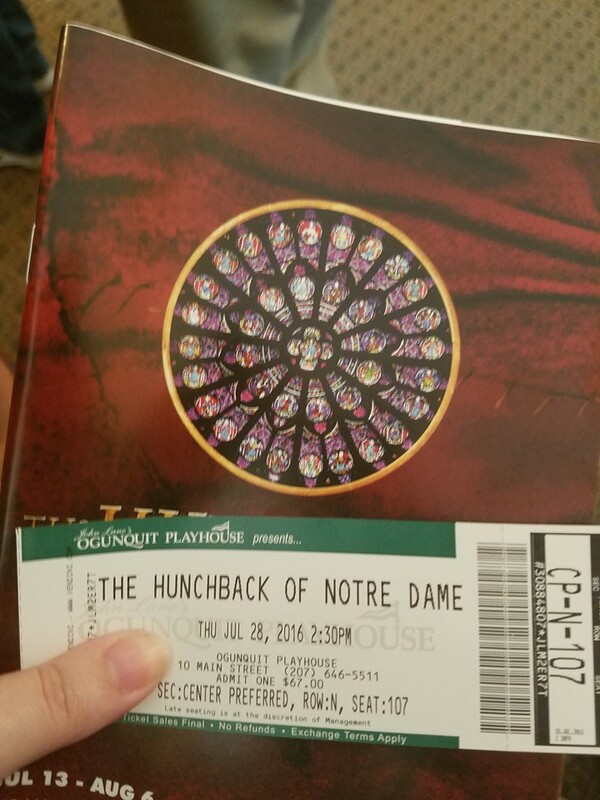 I love productions of “Hunchback” that have costumes that are not carbon copies of the movie. Oh my gosh I’m so jelly! I can’t go on trips on my own yet and I really wanted to see this, sounds like it was fun. The best things we get in our playhouses is Camp Rock..